Are you looking for a new outdoor hanging chair for your porch? Patio swings are widely popular for their exquisite designs and vivid variants and could be a perfect option. In case you’re planning to purchase your first patio swing, here is a quick scoop on their features. Whether you are looking for classic wooden swings or the canopy ones- here is an overview of different types of patio swings and swing accessories and everything that you wanted to know about them. 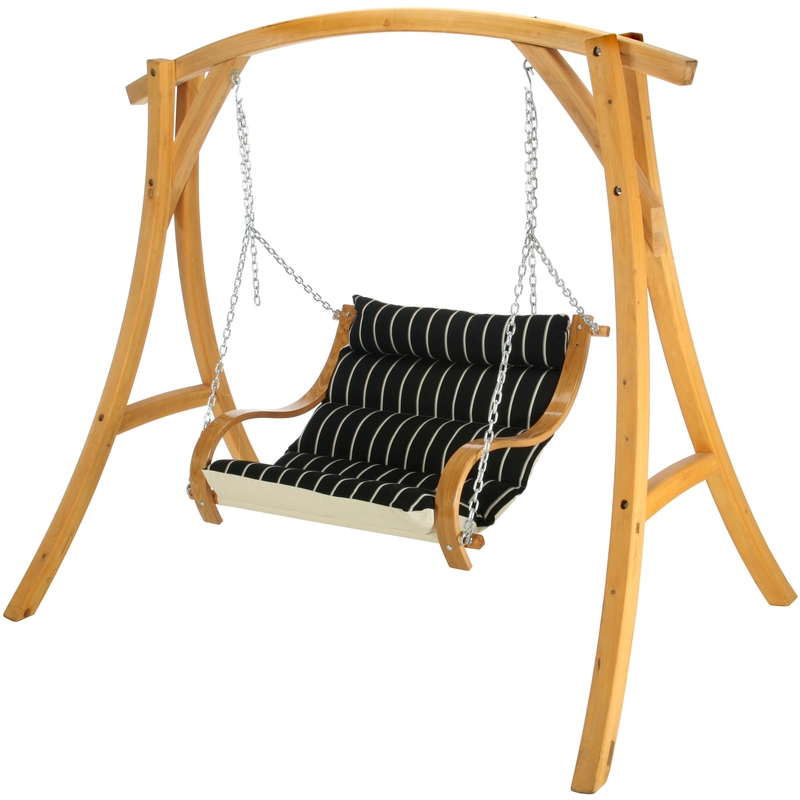 If you are looking for some traditional home design products for outdoors, investing in a classic wooden patio swing can be an excellent idea. With an average size of four foot to six foot, these swings offer fun for the whole family. Most of them come with a capacity to hold more than 400 lbs. 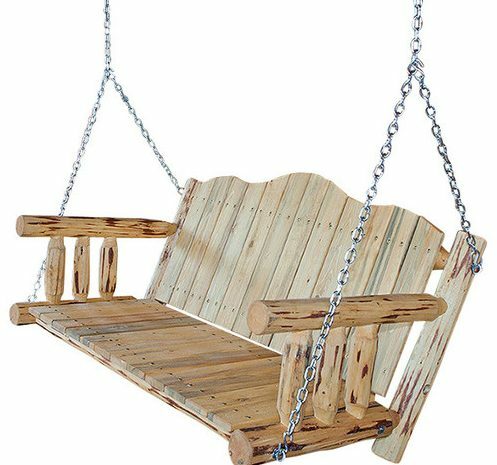 Mostly made of unfinished cypress wood, these swings have an indelibly beautiful charm about them. Some of the classic wooden patio swings are also made of Western Red Cedar, which not only looks impeccable but also resists rot, decay and damages from insects. They are expensive but last a lifetime. You can add your preferred finish to these swings or can leave them natural. 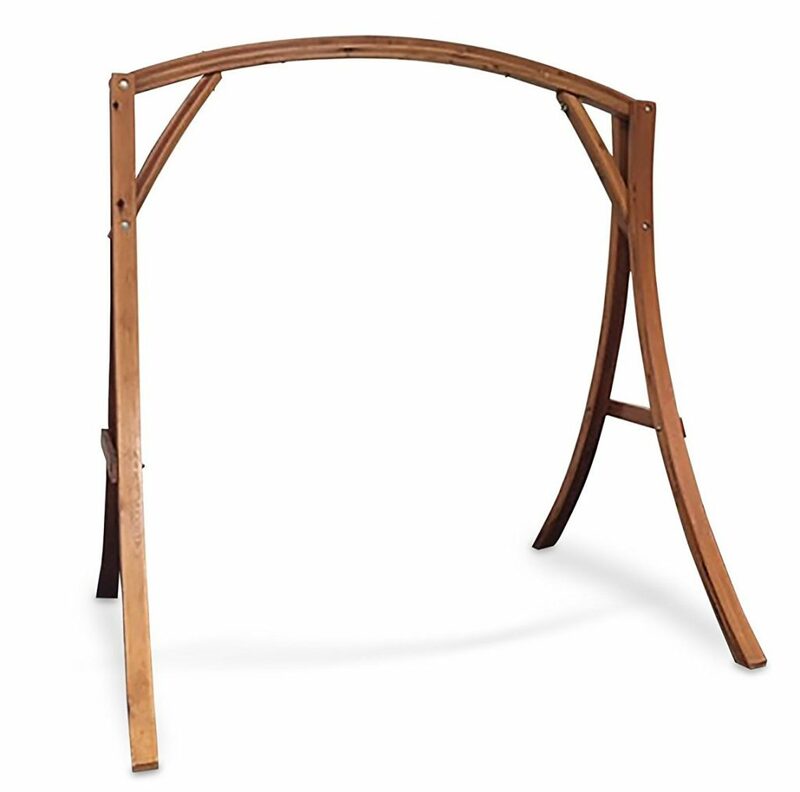 Being manufactured under the best conditions, this classic wooden patio swing, handmade from Louisiana Cypress trees, will truly live up to your expectations both in matters of design and efficiency. 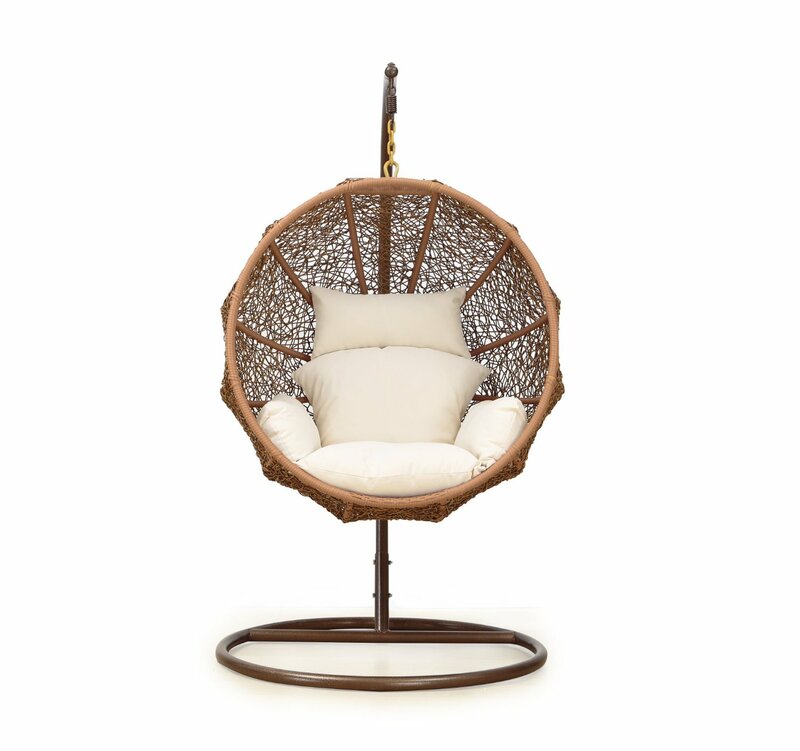 Wicker patio swings are not only there to add some romance to your outdoors. They also can be a great option if you are looking out to add a raw appeal to your home. You can add an entirely new definition to your warm evenings, with a finely crafted 6ft wicker swing. This kind of furniture lasts long. Being crafted from wicker that is resistant to all conditions, you can also enjoy the longevity of the products to the utmost. 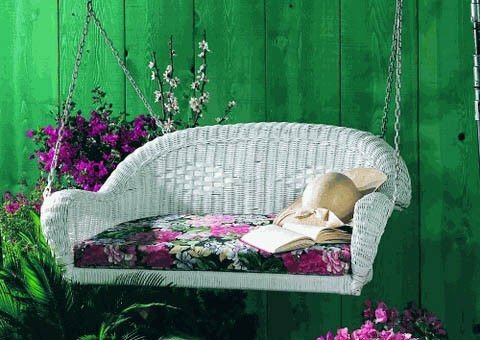 The all-weather wicker porch swings are built to bear with everything that nature throws along their way. 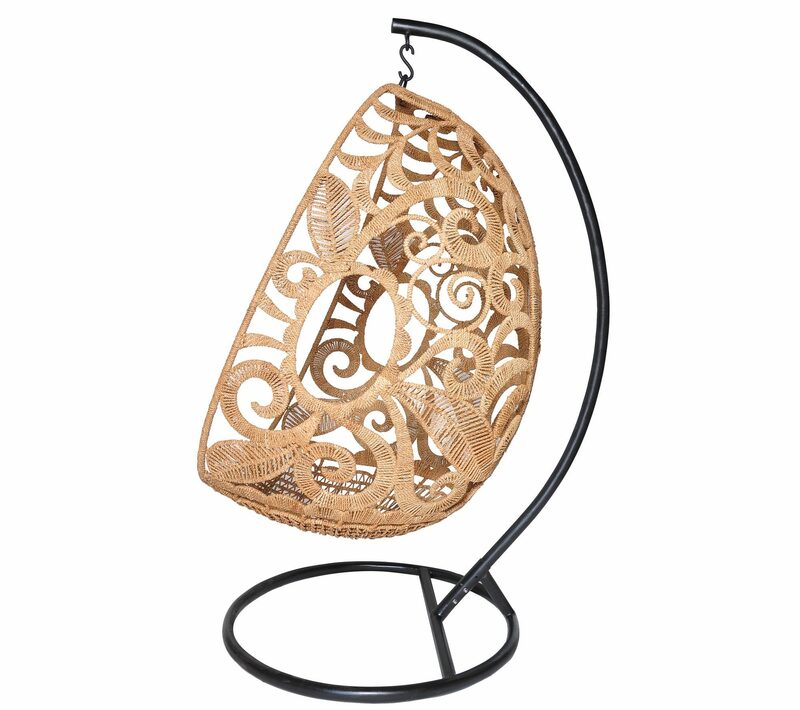 The wicker hanging swings are also highly attractive because of their incredible design and finish. You will find them mostly in a flawless dark brown, black or white finish. The swings also feature clean lines and a perfectly modern weave that adds to the cool quotient. Team up these handwoven wicker patio-swings with some colorful cushions for a yet trendy appeal in your garden. The products turn out to be maintenance free and they do not fade, crack or even warp. Each of these swings come pre-equipped with the hanging hooks that further aids in mounting. So, if you are looking for a piece of furniture that will exemplify the chic and trendy look of your home or patio, investing in these exquisite ranges of wicker patio swings can be an excellent idea. And if your balcony is too small for a 3 seater garden chair swing, a swing chair, also called “mini swing”, could be a great option. Outdoor wicker single swing chairs don’t take up much space on your balcony and also turn out to be an excellent home styling option. If you are looking for a more modern look and feel in your garden, the canopy porch swings can be a perfect option. These swings easily fit any backyard and they come with a cover that protects them from the sun. Likewise, they also come equipped with cup holders that let you enjoy your favorite beverage swinging away stress from the day. The frame being made of stylish and chic steel, further ensures that you enjoy a steady yet comfortable experience on the swing. This steel frame has been designed to hold a weight of around 600 to 700 lbs. 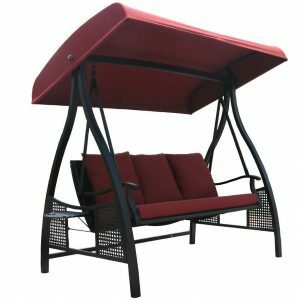 The canopy porch swings fit anywhere and everywhere, thereby letting you enjoy outside on the patio at your deck or garden. They are easy to assemble because of the self-standing swing seat, the cover and a stand. Each of these swings also comes with a proper cloth that renders UV protection. The swing turns out to be extremely spacious and they come with pillows and cushions, arm rest, foot rest, a pillow for resting your head and a cup holder. Sometimes the seat can be folded into a patio swing bed, so you could also sleep in it! So if you’re looking out to add a modern appeal to your abode, a patio swing with canopy can be a great investment. Some types of swings are fairly heavy, and support beam of your porch is not always sufficient to support the weight of the swing and persons sitting on it. If you’re looking out for an accessory that gives your outdoor swing the perfect support, choosing swing stands can be a great idea. Most of them are also made of wood or powder coated steel and a rust-resistant finish, that make them withstand almost every weather condition. The stands usually come with a 6-7 foot tall design and a weight capacity of 300-500 lb, to safely swing 2 or 3 adults. 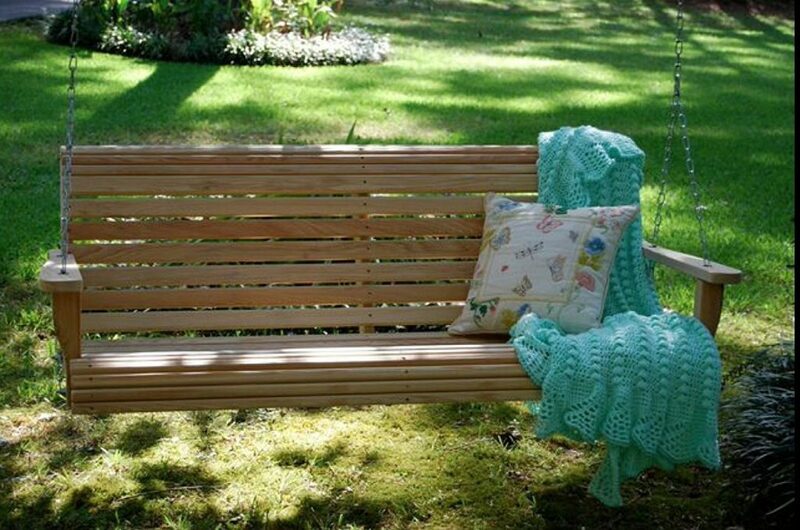 You can place a free-standing swing wherever they like; on your porch or in your garden as well. Well, now that you’ve browsed through the best ranges of patio swing and swing accessories, make your pick of the best in order to enjoy a relaxing experience all way around.